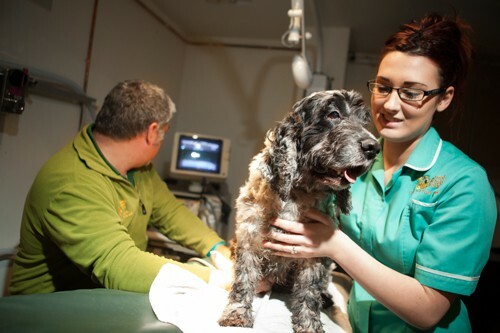 We were approached by Goddard vets to come up with a campaign to help them launch a new training package to their staff via their company intranet. 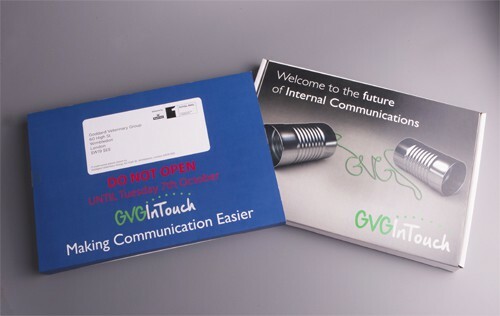 We created a whole new brand for this campaign called GVG In Touch. The campaign was to be based around the theme of take a break and visit the training site. 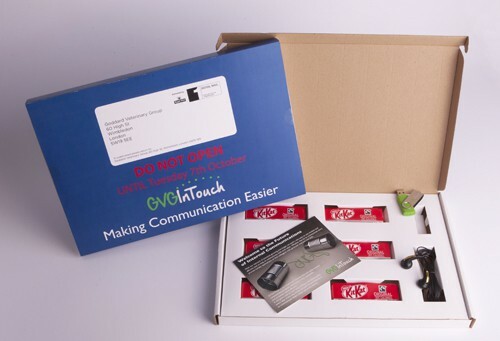 We devised a box, which would hold KitKats, USB stick headphones and a instructions card. 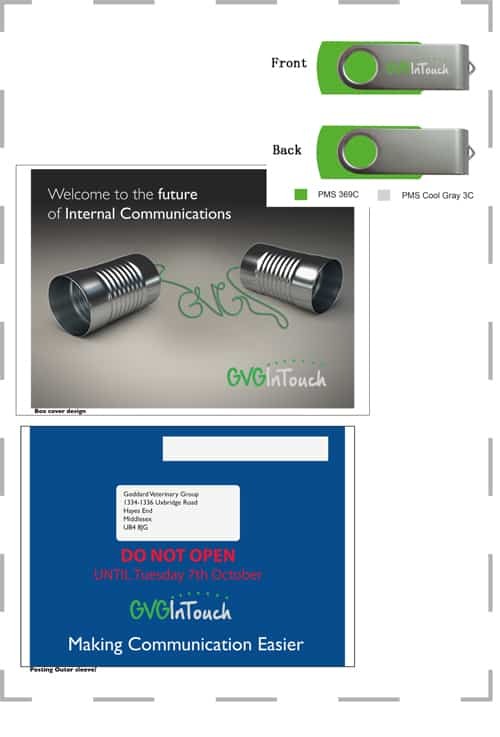 This campaign was due to be launch on Tuesday 7th October, all boxes were produces, products placed into the boxes, sealed and each box address to the 50 different branches these were then posted out to each practice for the staff to open. 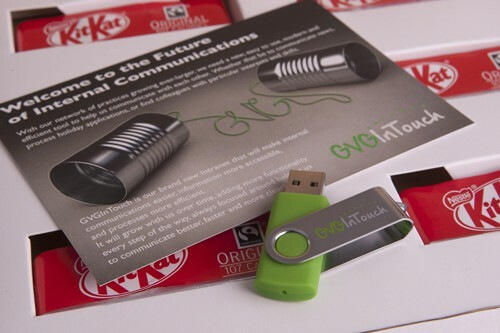 The USB sticks were branded and also had data applied to them about the training site and also contained training videos. So the staff could take a break, eat a KitKat put on the headphones and watch the training videos. 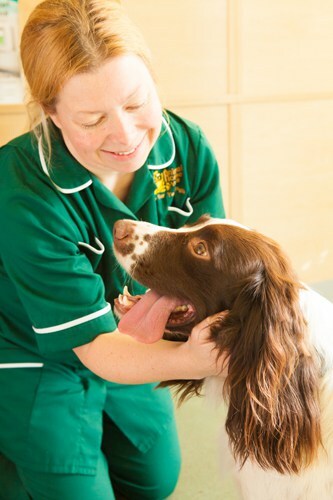 We have just launched a brand new Pet Scheme for Cherry Tree Vets, who you may have read about in one of our previous blogs. 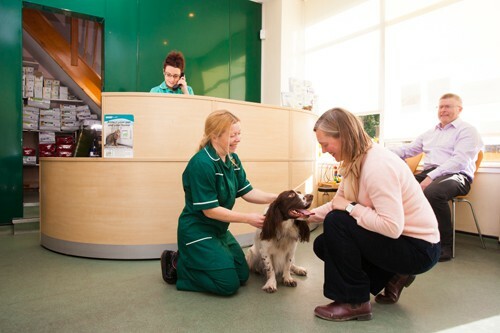 Cherry Tree vets are a practice we rebranded about a year ago, Marie the practice owner called us in for a meeting in September to discuss how we run and promote our pet health schemes. Marie has really grasped how important having a brand/logo professional designed is. She is really pursuing those lifetime value clients with her new signage, photography and now the launch of their very own branded pet scheme. 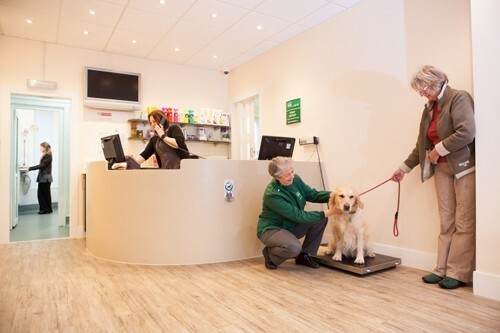 Completely bespoke to Cherry Tree Vets, this scheme was launched within two months. 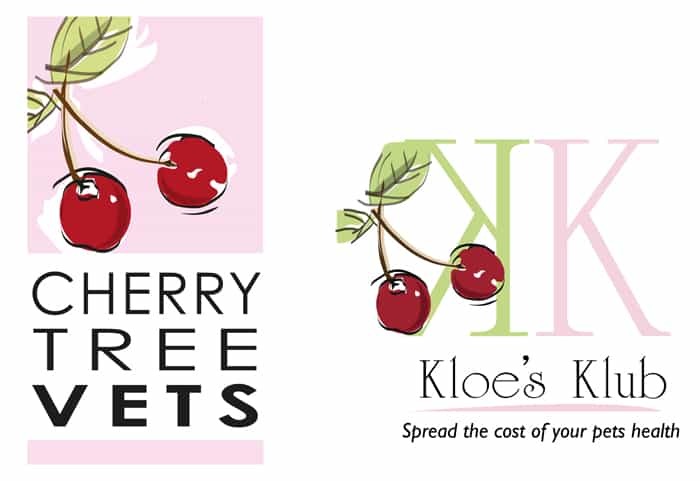 From our initial meeting in which we discussed Marie’s brief for her pet scheme, we came back to her within the week with a logo and brand for her scheme, separate from her own practice brand but very much still part of Cherry Tree Vets. 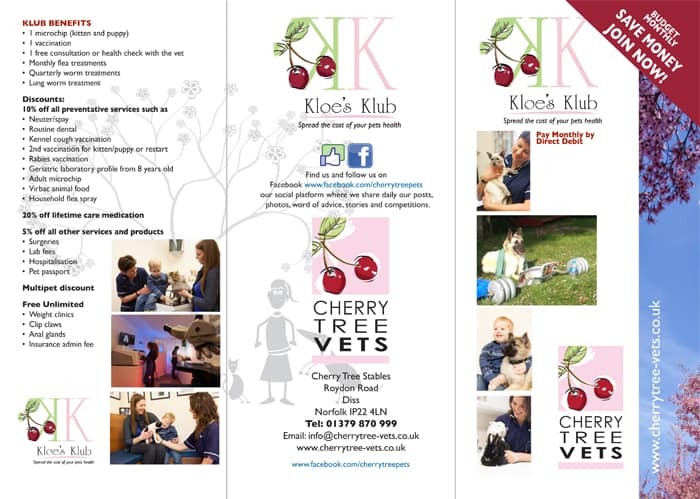 A month later Cherry Tree vets now have their pet scheme Kloe’s Klub with pull up display, promotions, trifolds and posters and they are signing up clients! As well as the marketing side of the scheme we also set up the collection side through our direct debit collection arm Vet Debit. 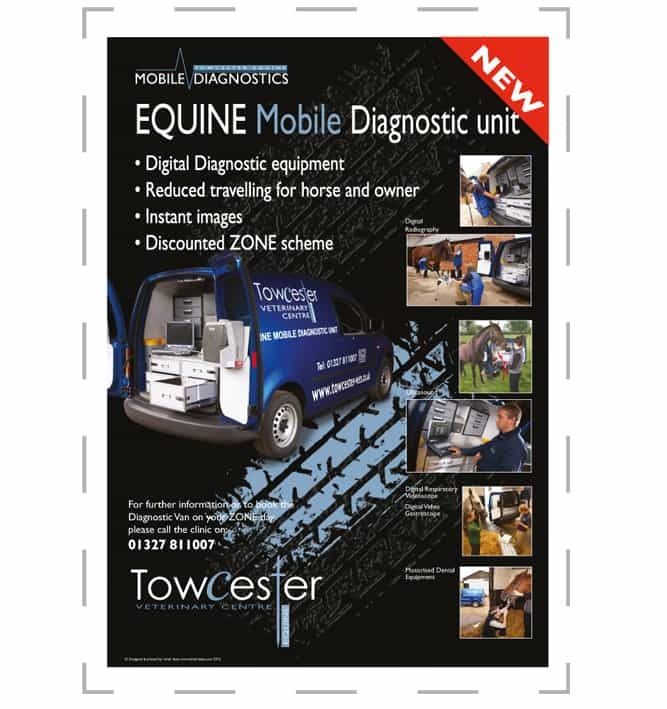 Give us a call for more details on how we can help set up your very own branded scheme and allow your practice to collect your own money! 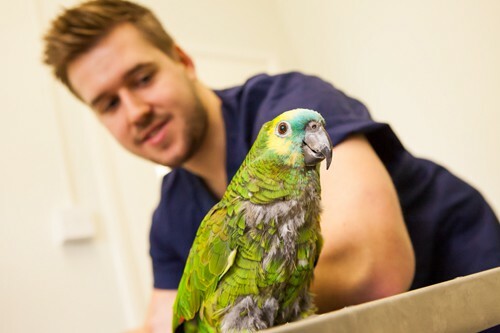 It is important to be constantly promoting your veterinary practice services and skills, to attract new lifetime value clients. 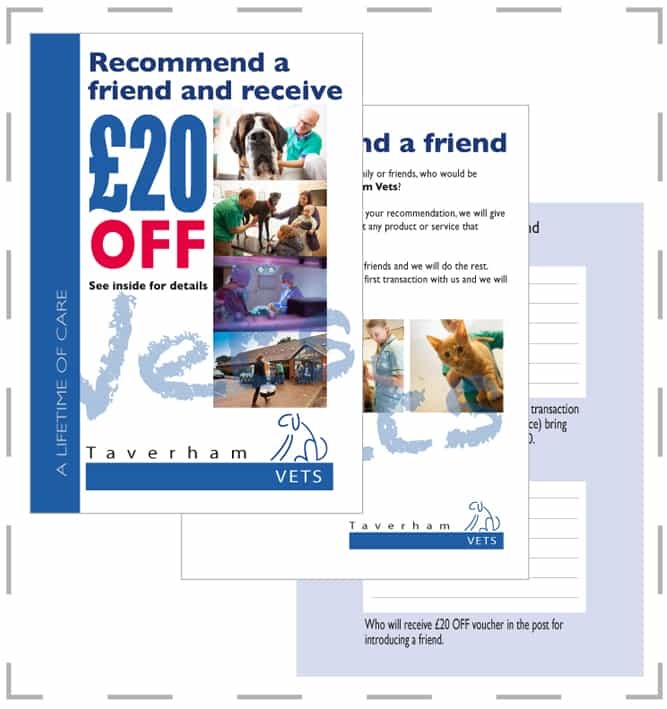 We are continually coming up with the latest veterinary marketing ideas, from voucher books, to posters, recommend a friend etc. It is vital that all marketing concepts are branded to you practice; they have to entice clients as well as look professional. Keeping clients up to date with the latest practice promotions and shouting loud and proud about your services, will keep you practice ahead of the competition. Initial Ideas, has a wealth of experience in creating effective marketing ideas and delivering them in a professional and practice branded package. For the last 20 years we have seen all types of practice initiatives and know which ones work! 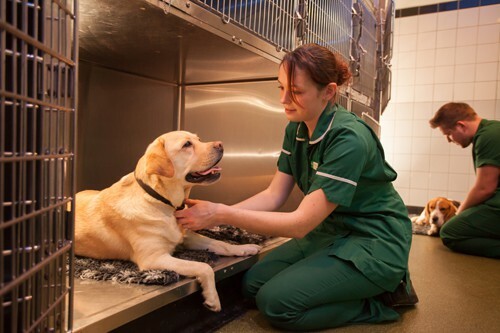 This blog demonstrates a few of our most recent marketing initiatives being rolled out across some of our veterinary practices. 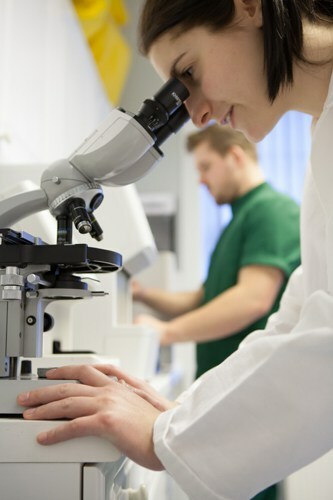 You will see that logos, branding and photography play a vital role in making sure these initiatives fly! 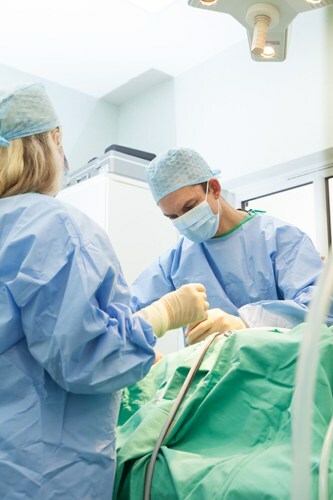 Whether it is creating a promotion for a new piece of surgical kit your practice has invested in, a new building extension or the latest hydrotherapy machine. If you don’t market it properly how will your clients know about these new services and ultimately how quickly will you see a return in your investment? 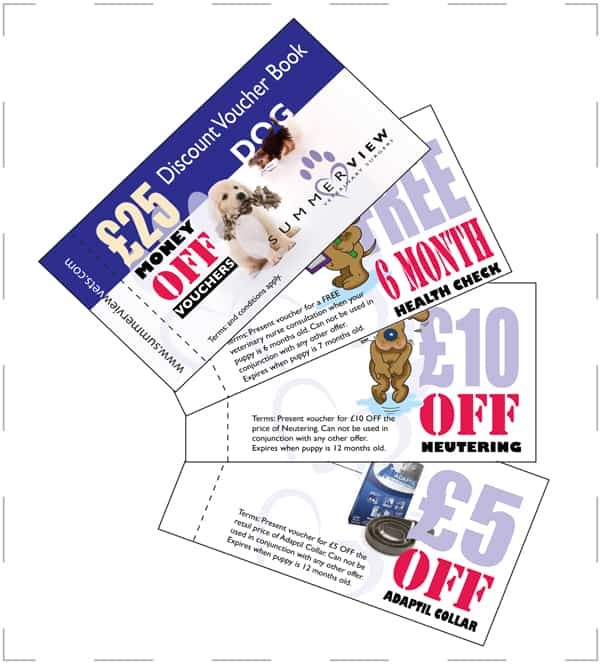 If you’re stuck for veterinary marketing ideas then give us a call and see how we can help. 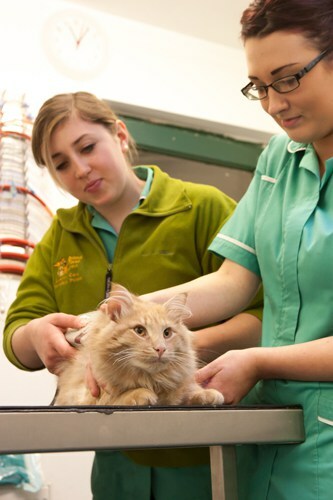 We worked with Heathfields Vets initially for a photography day (more about these days on our photography page). 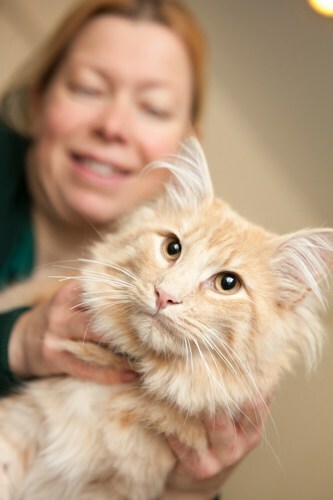 During this photo day we met with one of the partners at Heathfield Vets and discussed their logo and current imagery. The logo on their right is their old logo, which was not doing them justice. Its looks very out of date and didn’t reflect the level of care and professional service inside the practice. 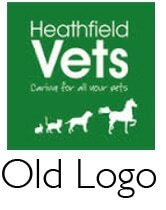 Heahtfield Vets instructed us to re-brand them and come up with some bespoke new logo designs to give them the edge over their competitors. 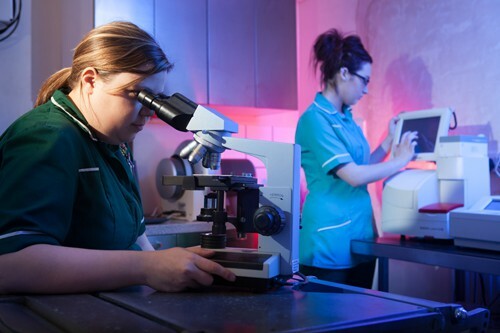 A local veterinary practice had just opened up a mile away so it was vital to get ahead of them when clients were deciding on where to join. The final logo design is shown on the right, this is a really bold, fresh looking design it instantly stands out and creates a more professional image for the practice. 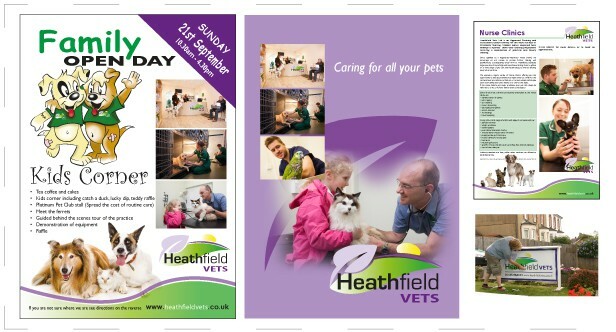 From this logo design, we then developed the brand using the colours and graphics to apply to all the marketing literature at Heathfield Vets. 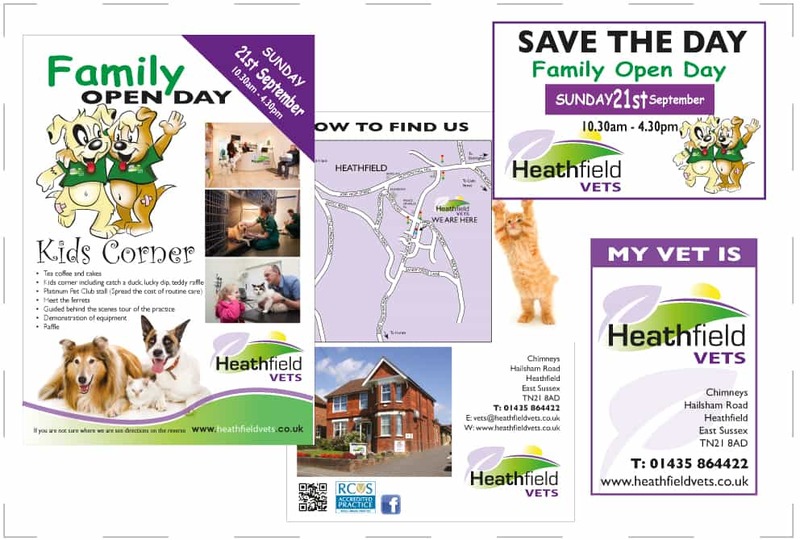 We started with some new designs for Heathtfield Vets, we took into account their interests, location and name when coming up with our designs. On the left are a few of the ideas we presented. We really wanted to emphasise the area this practice is in, out in the countryside of East Sussex with the South Downs in sight. 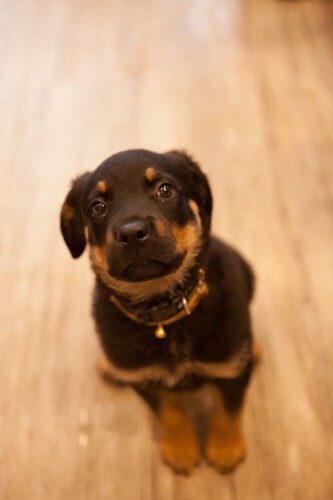 It is also important to detract from using dogs and cats; nowadays it’s not about distinguishing whether you’re a veterinary practice, BUT which veterinary practice. An eye-catching graphic will aid this. You will see great photography plays a vital role in impactful, professional marketing. The photos below were taken at one of our photography days. (more info on these days on our photography page) If you think your practice could benefit from one of these days, get in touch! 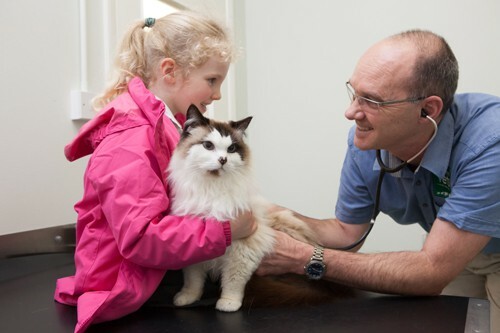 Mark Binns owner of Animal House Vets wanted to make more of a dominant impact in his area to compete with other veterinary practices. He had 3 branches and was due to open his fourth. His previous logo was quirky and had great distinctive qualities so we advised him that an up lift to the logo keeping the key features off the old logo but modernise it slightly would give a great result. This new logo and brand could then be launched at his new practice, to then be rolled across the other branches to encompass them all under the one Animal House Vets umbrella. The logo on the right is the old Animal House Vets logo. 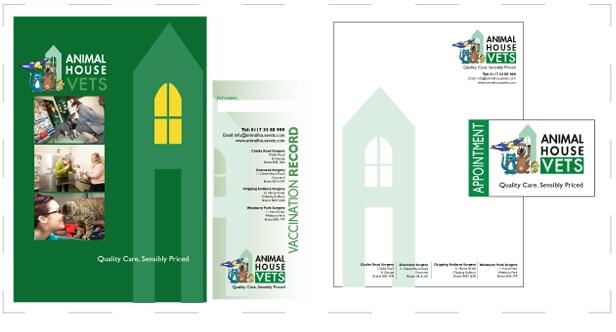 The logo on the right is the finalised version of the new Animal House Vets logo, we then ran this across all of Mark’s marketing, from enquiry packs, posters, stationery etc. Some examples of which are below. The logos on the left are a few ideas we developed to give a update to the old imagery. From the Active Health Club logo we then created all the marketing promotional material, to inform and attract clients. Some examples are shown on the right. 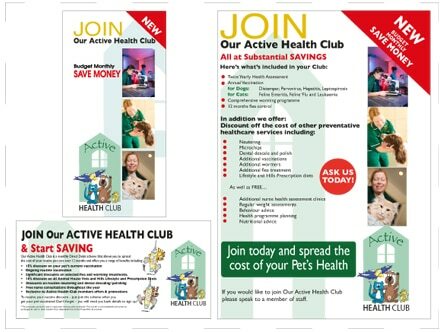 Our next project with Mark was to launch an Animal House Pet Health Scheme, entirely branded to fit with the latest logo and marketing literature we had designed. 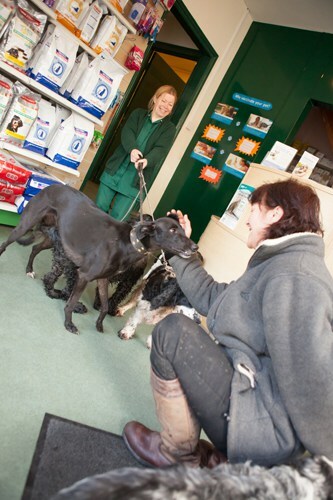 It was important that this Pet Scheme was very much Animal House Vets scheme and not a corporates. 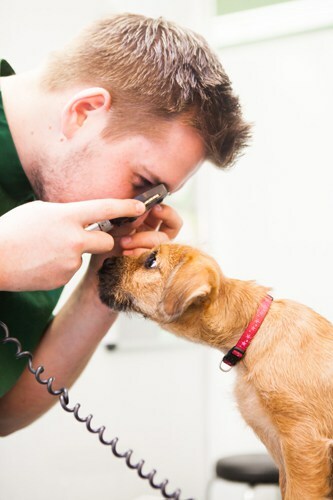 We created an independent logo for the pet scheme, which still shows a very clear link to Animal House Vets but having its own logo/brand helps with promotional material. 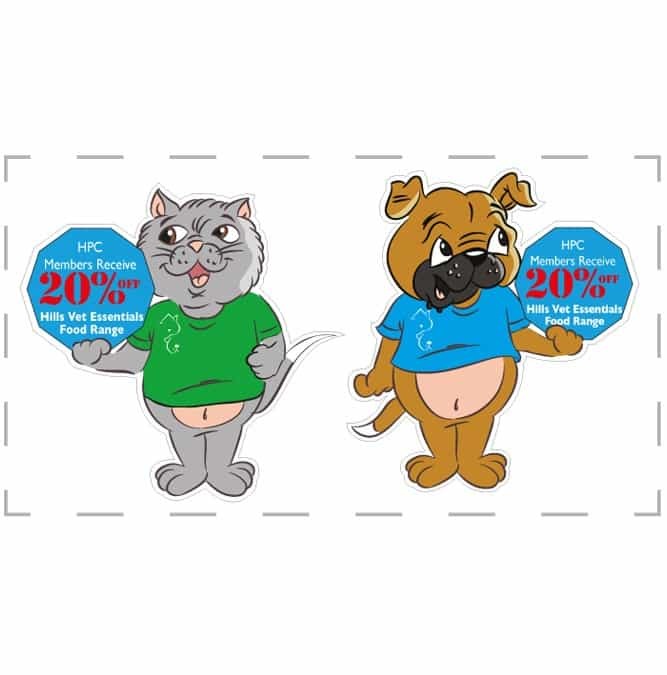 The logo on the left is the new Animal House Vets Active Health Club. 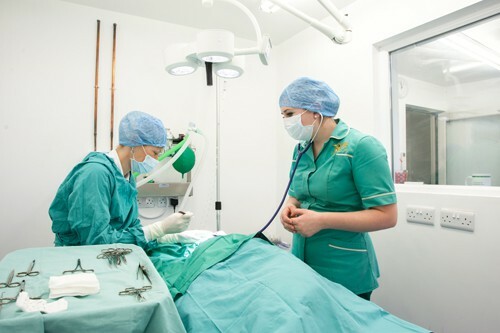 Above is a selection of photos from our photography day with Animal House Vets. Please visit our photography page for more information. 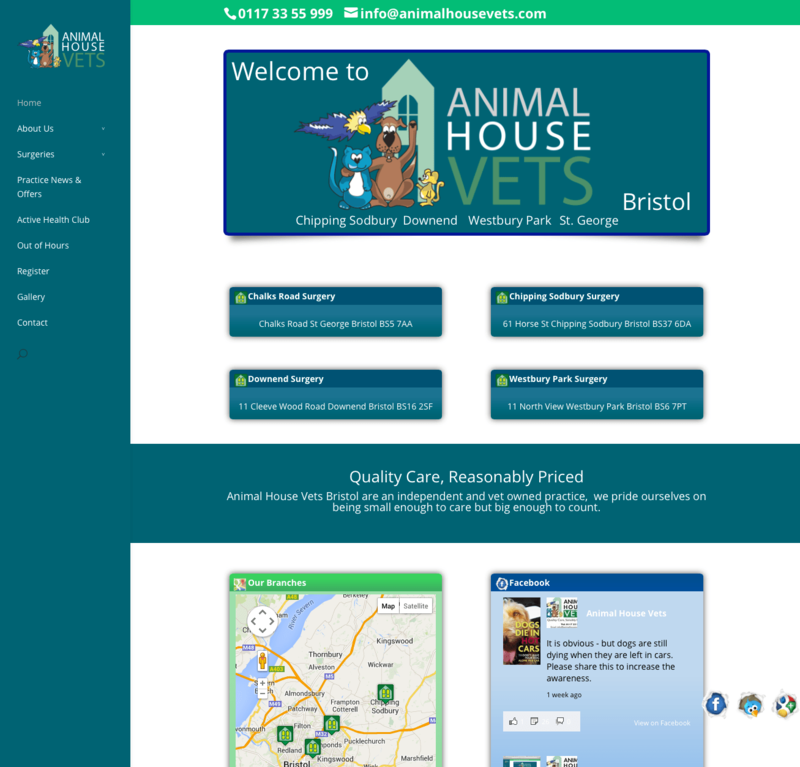 The most recent project we have just completed with Mark at Animal House Vets, is his website. As we have created all the ‘magic pieces’ such as the new logo, graphics, colour scheme and photography this was then all applied to the website to create a bespoke branded and fully adaptable site.